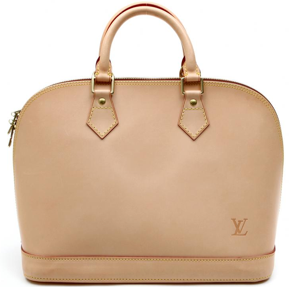 This elegant, polished, sophisticated Louis Vuitton Custom Order Natural Leather Alma Bag in natural tanned leather is an absolutely stunning LV. I guess that’s why it’s called the natural leather alma bag. Alma means soul in Spanish, and this LV natural tanned bag definitely has a lot of soul. This Louis Vuitton is like a cross between a briefcase and hobo. The shape is perfectly formed and is the ideal bag if you want to present an elegant, polished, sophisticated, educated appearance. The natural leather handles on this Louis Vuitton Custom order natural leather alma bag make this LV easy to carry whether in your hands or as a shoulder bag. (Although it does look easier to carry in your hands). The gold brass zip is incredibly solid and secure, not to mention well made (what else can you expect from an LV) This Custom Order Natural Leather Alma Louis Vuitton bag is second hand, but in good condition.